When it comes to traveling in comfort, the Trtl Pillow easily takes our top spot as the best travel pillow. Not only is this pillow ergonomically designed, it’s also reasonably priced. Comfortable, convenient, inexpensive — what’s not to love? 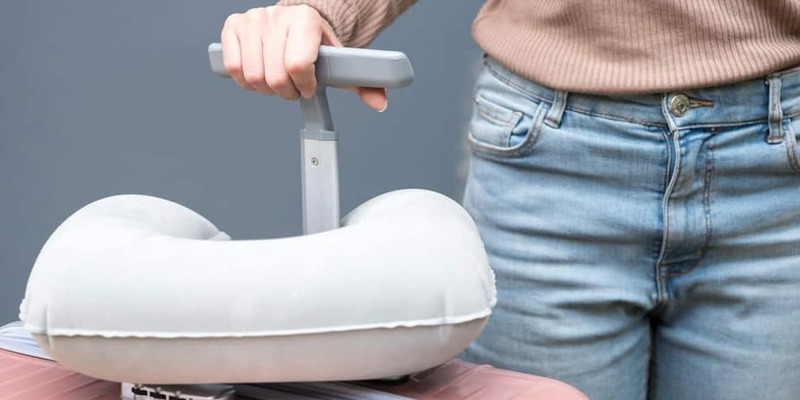 Buying the right travel pillow can make a long journey more tolerable, but a poor-quality pillow could lead to short-term injury. You’ve likely seen passengers on airlines using a huge variety of models. So how do you decide which products are best, and which products aren’t worth your time? There are numerous factors to consider, such as whether to pick memory foam or opt for an inflatable neck support. Each option comes with its own advantages and drawbacks, including space consumption, cost, and materials. What’s more, some models are more prone to having you fall asleep in a less-than-flattering position. Below, we’ve highlighted the best pillows for travel available right now. Snooze as you cruise. These travel pillows will provide your neck with the support it needs. 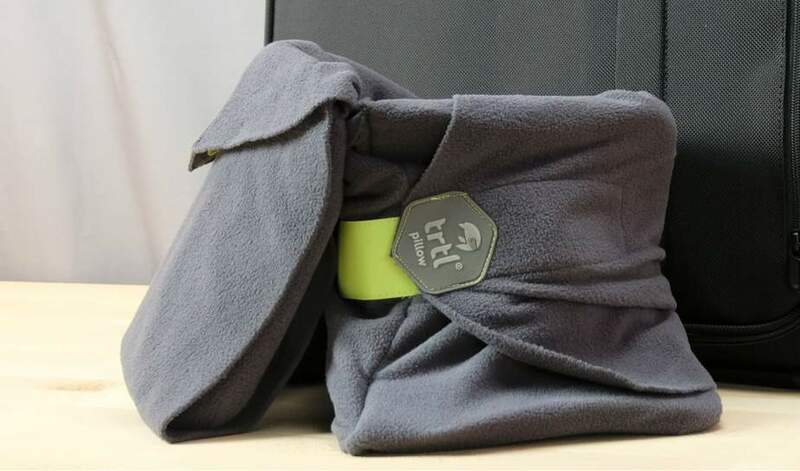 The outright winner simply has to be the Trtl Pillow, keeping you propped upright to avoid embarrassing drooling scenarios. 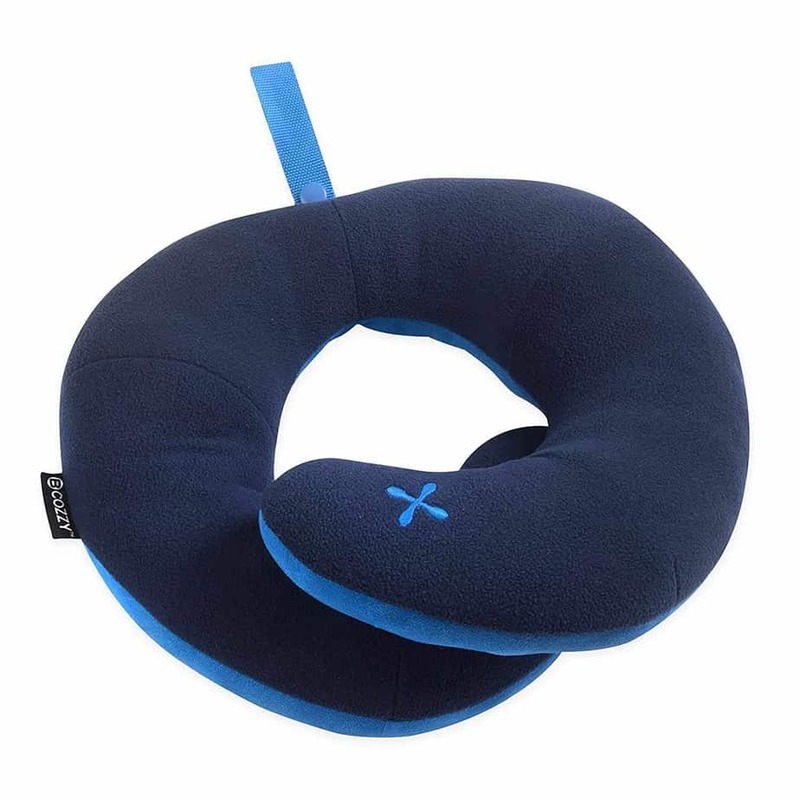 For the best value for your money, the Travelmate Memory Foam Neck Pillow is the way to go. This pillow doesn’t sacrifice on quality and it won’t break the bank (or your neck). If you need comfort without sacrificing style, the Therm-a-Rest is an attractive product that reuses materials from old mattresses. 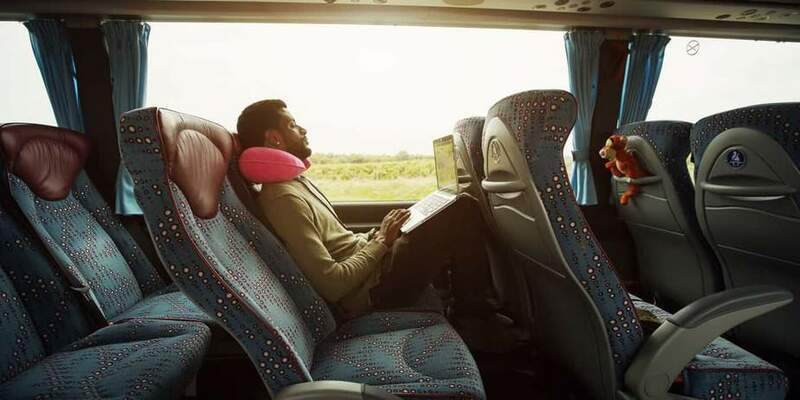 Travel pillows have been in use for decades, providing stable support when catching some shut-eye on long journeys. The origins of this product lie in a simple U-shaped design that has largely remained the standard for many years. However, some variations such as the inflatable pillow and full-body pillow are shaking up the market. Travel pillows provide much-needed support for when you nod off in unnatural positions. 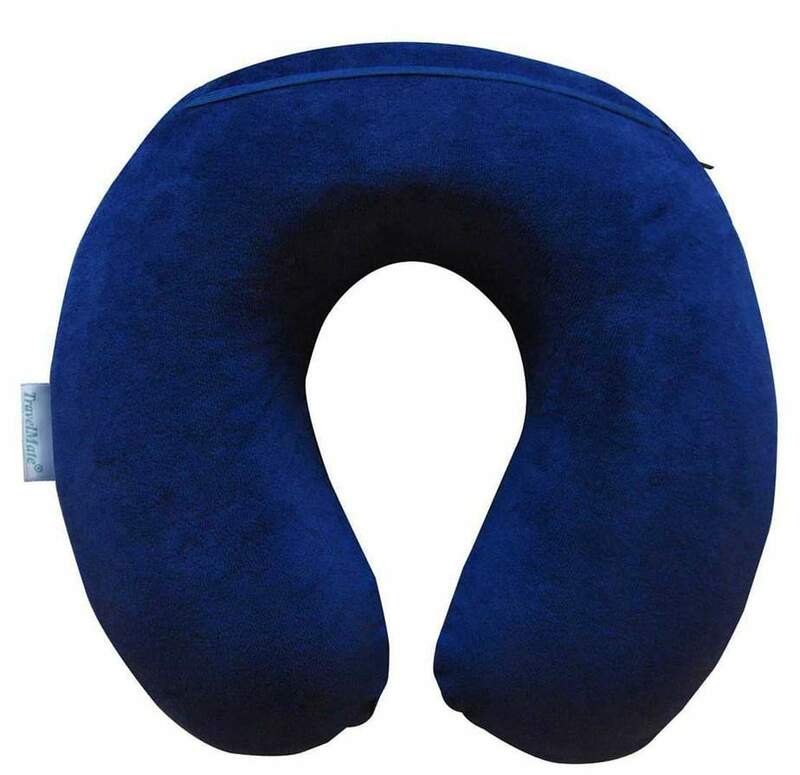 Though you can use a travel pillow for bus, car, or camping trips, most shoppers pick one up for long flights. Having a pillow for those lengthy journeys can make the difference between a peaceful nap and disturbed, fitful sleep. Since you’re used to sleeping lying down, your body needs support to avoid aches and pains when sleeping upright. As you drift off, your head will naturally gravitate towards the ground. Without proper support, this could lead to a stiff neck, strains, or headaches. One of the first decisions to make is whether you purchase an inflatable or non-inflatable pillow. They’re both adept at supporting the head and neck, so personal preference comes heavily into play here. However, each type does have its own benefits that may help sway your decision. Inflatable pillows excel at maintaining a tiny footprint within your luggage, as they fold down to a lightweight shell when deflated. However, you pay the price of having to inflate them before every use. This could become annoying not only to you, but to your neighboring passengers. On the other hand, non-inflatable pillows are instantly ready to use when you need them most. The trade-off is that they’re heavier and compress less easily when not in use. However, they can incorporate materials such as memory foam, which provides class-leading support. Before you make any final decisions, it’s also worth considering whether washing your pillow is going to be a difficult task. Some designs and materials are more easily cleaned than others, as some can be machine washed. If you’re going to use it regularly, then you’ll need some way of freshening up your pillow from time to time. Provided you avoid pillows made from cheap styrofoam, there are means of effectively cleaning every travel pillow. Memory foam pillows most frequently utilize removable covers that can be thrown into the washing machine. Inflatable pillows may use similar covers, or they may be made of materials that can be wiped down. For pillows without a removable cover, there’s an alternative. Spraying the fabric with fabric fresheners can effectively remove odors, though stains could still be an issue. So if you want a pillow that can easily be cleaned, your best bet is to look for one with a detachable cover. The speed with which the pillow inflates and decompresses, if it’s inflatable. This isn’t necessarily an exhaustive list. Reviews aside, your personal preference matters, too. Everybody favors a different sleeping position, so finding a pillow to suit you and your style is just as important as picking a high-quality product. Our top picks should help guide you towards making the right choice and avoiding aches and pains. To ensure that we only recommend the best travel pillows, our methodology is based on real customer opinions. We gather data from across the internet to work out which products customers are already raving about. We also aggregate scores from websites like Amazon to judge how each pillow ranks on key criteria. We then assign a composite RAVE Meter score based on these important variables. This gives us our final list of recommendations, based on the experiences of thousands of consumers like you. The below criteria are important to us when selecting our winning products, and these help us to determine the product scores. The convenience, in terms of space consumption and carry weight. The Trtl Pillow is in a league of its own, doing away with the common yet cumbersome design of unwieldy U-shaped pillows. This pillow could easily be mistaken for a scarf, with a wrap-around design that fastens against your chin. Showing other travelers your gaping mouth and pearly whites is a thing of the past, and there’ll be no more drooling. Falling asleep against a traditional U-shaped travel pillow often results in a neck that’s angled unnaturally. This places stress on your vertebrae, which can lead to temporary discomfort, or long-term neck and back pain. But the Trtl circumvents all of that. It is the best pillow around for maintaining a natural, ergonomic position when snoozing. Carrying this pillow around won’t be a pain in the neck, either! At just 148 grams, you’ll barely notice it’s there. Plus, you can save space in your carry-on luggage by attaching the pillow to your bag’s straps. If you’ve ever tried it, you already know that falling asleep on an airplane isn’t the easiest task. Even if you do finally manage to nod off, you’ll often be awoken by your head falling forward. The BCOZZY helps to avoid this. It’s closer to your typical U-shaped design than the Trtl Pillow, but includes wrap-around chin support. The chin support prevents your head from tilting forward into your chest. However, although it’ll stop your mouth from falling open, it also makes you prone to the unflattering “double chin” effect. The good news is, if you’ve been known to drool from time to time, the pillow can be thrown into the washer. It’s the higher price tag and sometimes-itchy material that drops this pillow into the runner-up spot behind the Trtl Pillow. However, these niggles aren’t major enough to stop us from recommending it as one of the best travel pillows. One of the reasons that this pillow takes the third spot on our list is because its unique design provides full lateral support. The pillow promises proper head and neck alignment, and it’ll also prevent your chin from falling forward. However, it just misses out on the top 2 slots owing to its less convenient method of inflation. Still, it takes just a few breaths to fully inflate the pillow, so it’s not a major drawback. 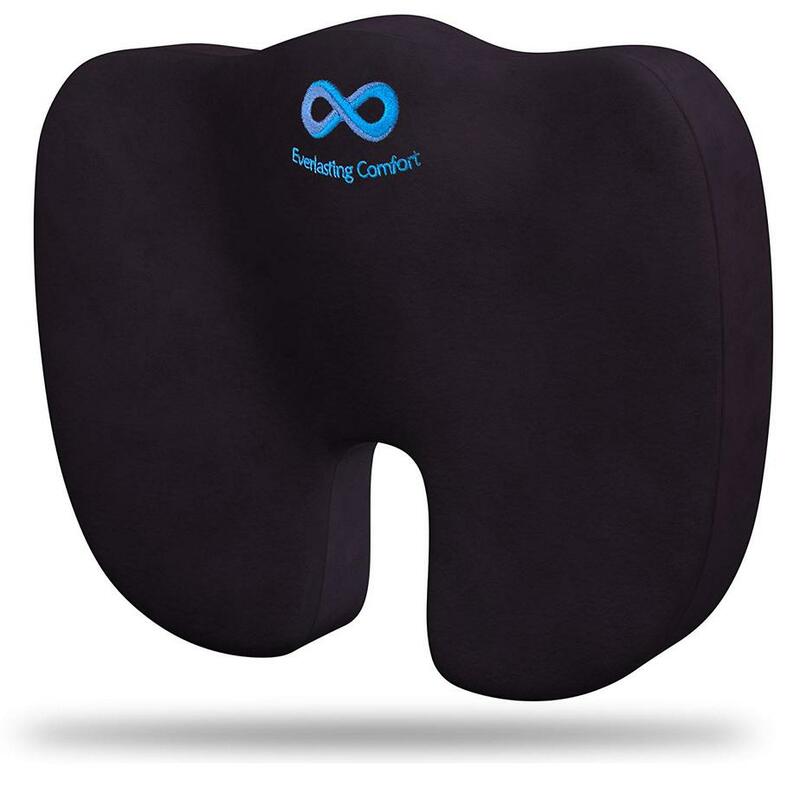 Air-cushioned support also offers a more familiar and natural sleeping position comparable to your bed. Though the inflatable design makes it incompatible with washing machines, you can easily remove odors and food stains through hand washing. The air valve is well-positioned and won’t prod and poke at your face or neck when in use. Once deflated, you’ve got a rolled-up bundle of fabric that stands at 2 x 9 x 3.5 inches, weighing 7 ounces. You’ll barely notice the footprint in your luggage. The Travelmate is your typical U-shaped travel pillow, but better — it’s made from memory foam. Thanks to the unique body-conforming material, you’ll get better support than with a standard foam pillow. The thickness can be adjusted with a removable insert, for even greater conformity to your specific shape. There’s no need to worry about spillage, as the memory foam is covered by a zippered plush velour cover. Once removed, this cover can be machine washed to get rid of those unpleasant odors and stains. Unfortunately, the label is located outside the cover rather than inside, but it’s only a minor nuisance if positioned carefully. As you’d expect from foam, this pillow is light, weighing in at just 12 ounces. However, it drops down to fourth place owing to its more cumbersome, space-consuming design. Thankfully, a built-in strap means that you don’t have to cram it into your luggage. Not all memory foam is created equal, or that’s how it would seem based on this travel pillow. Despite being one of many memory foam pillows we’ve included in this ranking, consumers have ranked the comfort of this particular pillow extremely well. It’s firm yet supportive, and it’ll spring right back into place even after prolonged use. The U-shaped design aids in keeping proper head and neck alignment, while a rear-mounted strap fastens to your seat. With a durable zipper hidden below a sleeve, you can slip the cover off to wash away those unpleasant odors. Speaking of which, the microfiber comes straight out of its packaging without any chemical smells. This pillow drops into fifth place on our ranking, though not because of any problems with durability or comfort: We docked points because there’s no way to shrink the pillow’s footprint before packing it into your luggage. There’s also no travel bag for carrying it separately, unless you purchase one separately. 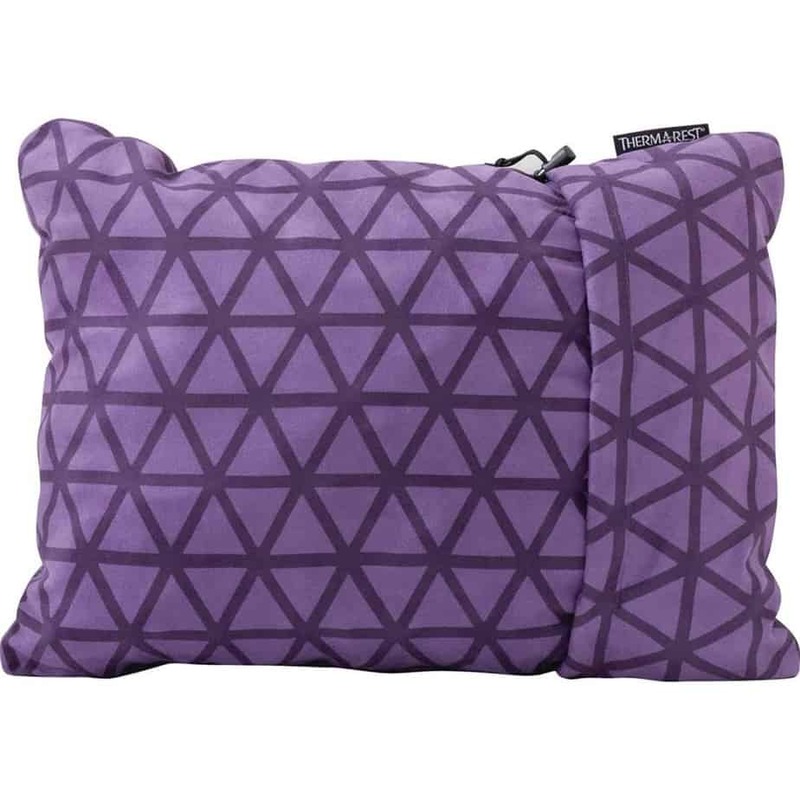 One winning characteristic of this travel pillow is its unique, highly contoured design. 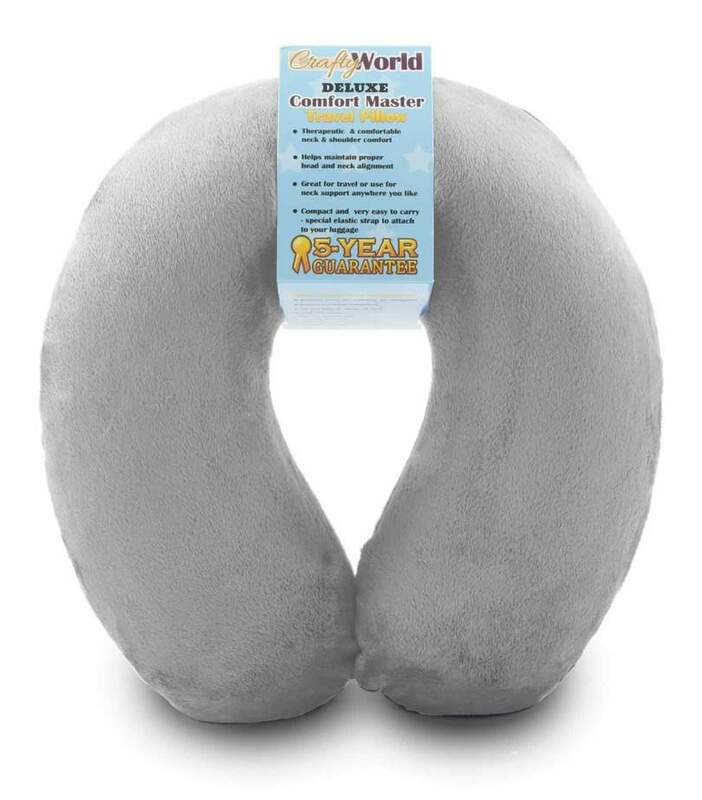 You’ll struggle to find another travel pillow that offers such structured support around the head and neck. Though the height of the memory foam may be too much for some users, it does prevent unnatural positions that can lead to pain. The rear of the pillow is flat enough to prevent your neck from being tilted forward unnecessarily. That said, some customers have reported a weaker segment of foam here, which has been known to snap after prolonged use on rare occasions. It’s for this reason that the Cabeau pillow loses some points for durability in our ranking. In terms of convenience, this pillow is at the heavier end of the scale, comparable to other memory foam pillows we’ve recommended. It weighs in at 12.8 ounces with dimensions of 10 x 5 x 9.5 inches. 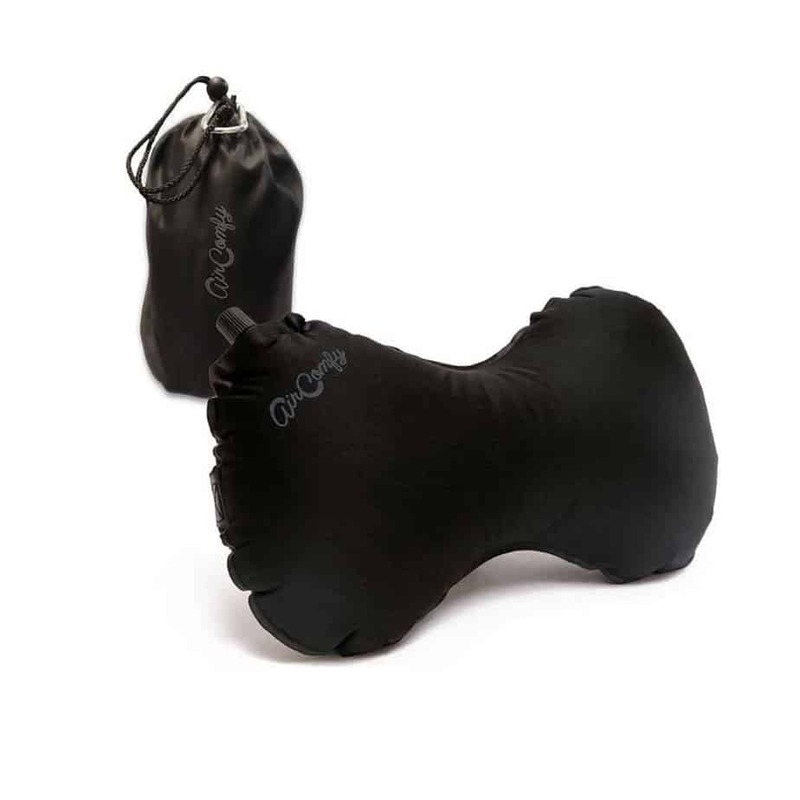 However, with an included drawstring bag, it can be compacted down to just a quarter of its full size. If you’re looking for something that breaks the mold, then the Therm-a-Rest Pillow is your best option. Ditching the drab blues and blacks, this pillow comes in all manner of colors and patterns. It also does away with the U-shaped design and other common travel pillow shapes, opting for a design closer to a bedroom pillow. As a traditionally shaped pillow, it’s perfect for all kinds of uses, including camping and staying at that friend’s place who doesn’t have a guest room. That said, it loses some points for being more difficult to secure against plane or bus seats, as there’s no strap. While sitting upright, you’ll have to use the weight of your head and neck to keep it in place. It’s for these reasons, plus a large footprint and slow drying process, that this pillow falls beyond the middle of our ranking. However, for the eco-conscious, there’ll be no better pick. This pillow is made entirely from an upcycled byproduct of Therm-a-Rest mattresses, which is why it wins our best eco-friendly travel pillow title. 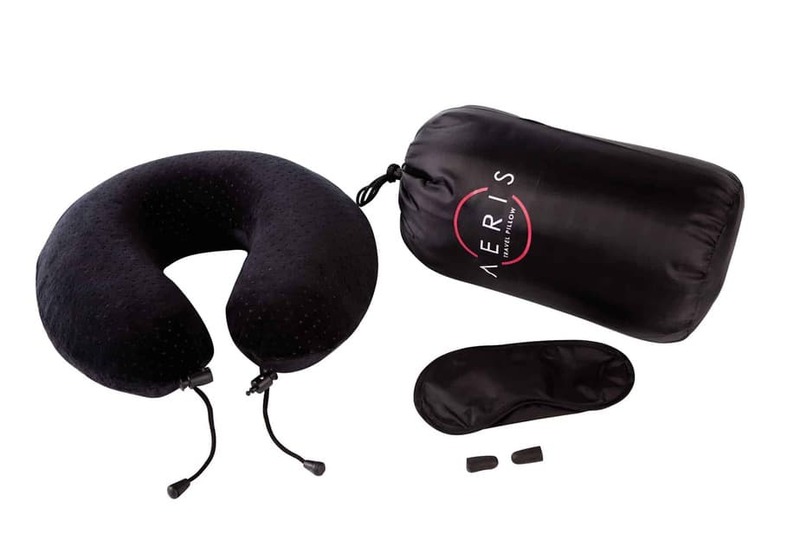 The Aeris Travel Pillow conforms to the traditional U-shaped design, though it’s heavier and bulkier than other memory foam pillows we’ve included. While these characteristics might be a drawback for some, this pillow does afford greater comfort and cushioned support around the neck than most of its competitors. With dimensions of 11 x 11 x 2.5 inches, and as a non-deflatable pillow, this is likely staying outside of your luggage. But the included drawstring bag means you’ve always got somewhere to store it. The ear plugs and eye mask, included for no additional cost, also sweeten the deal. In terms of disadvantages, there’s nothing that causes us any major concerns. The pillow can get pretty warm after extended use, and the tag would’ve been better-placed inside the cover. Those points aside, if you can handle the additional bulk, this memory foam pillow is extremely comfortable for long-haul travel. This pillow does what it says on the package: It offers an inflatable air pocket to provide neck or back support. It’s this multi-purpose use that lands the AirComfy a spot on our list, with full support for the lumbar back. However, it falls into ninth place due to some drawbacks that are difficult to ignore entirely. When secured to an airline or bus seat, the pillow’s extremely stable and adequate for supporting your vertebrae. But used in any other position, you’ll soon be wishing that it was slightly larger. Also, though the seat strap is useful, users in droves report that it’s easily forgotten when disembarking. Compared to memory foam pillows that weigh an average of 12 to 15 ounces, this pillow is just 2.4 ounces when deflated. It likely doesn’t shrink to the footprint you’d expect, but it’s light enough that it won’t leave a noticeable impact on your luggage. There’s also a carry strap that lets you save luggage space for that vacation shirt you just can’t live without. 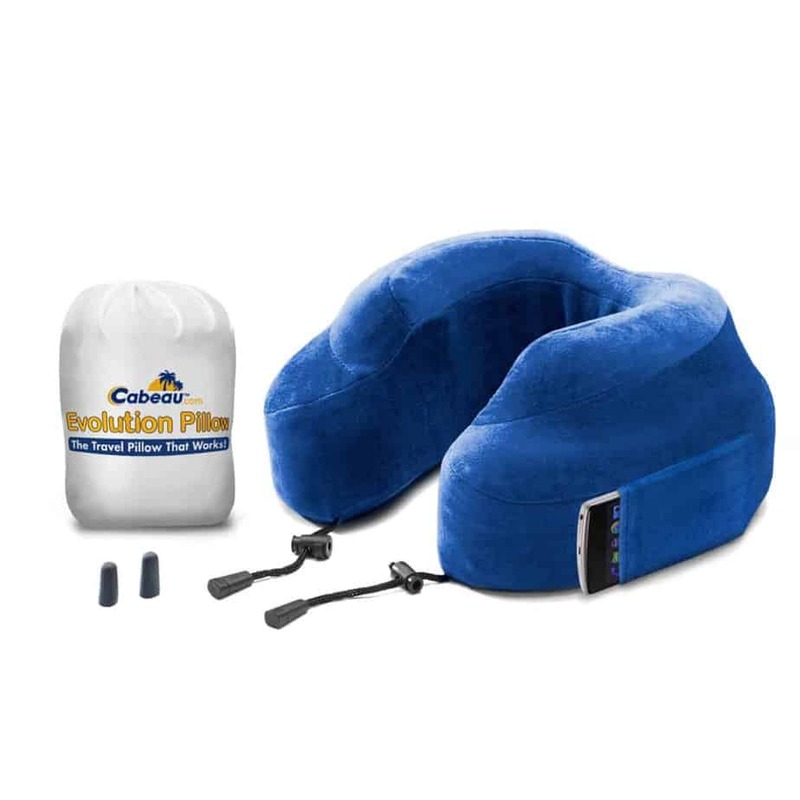 This is one of the few travel pillows that comes with additional goodies, including an eye mask and memory foam ear plugs to block out those other noisy travelers. What’s more, you can store everything inside a drawstring bag that also comes included. This pillow comes in last on our list mostly for its cumbersome nature. Whereas most of our other winners let you deflate or compress your pillow, this bulky memory foam doesn’t shrink easily. Your options are to take up considerable space in your luggage, or carry around the drawstring bag. It’s these inconveniences that push this pillow to tenth place. However, it still manages to snag a spot on our list thanks to the rare extra accessories. The built-in pocket is also a feature worth noting, and the phone pocket is a welcome touch. Why use a travel pillow? Falling asleep in an upright position isn’t natural, and it can lead to severe discomfort over time. But sometimes you don’t get the luxury of choice, particularly on long-haul journeys. If you’re routinely flying throughout the night or all day long, you’re going to nod off from time to time. 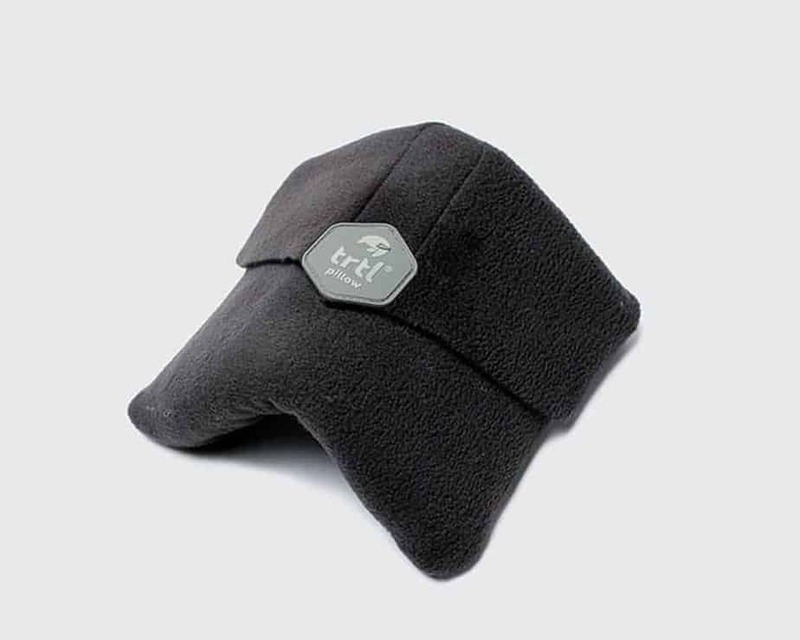 To prevent your neck from becoming stiff and painful, you can pick up a travel pillow. These products support your head and neck in a natural position, while letting you get precious shut-eye. This stops the aches and pains associated with the stress that would otherwise be placed on your vertebrae. And let’s not forget the embarrassing likelihood of ending up in a stranger’s lap. Falling asleep unsupported means that you could slide in any direction. 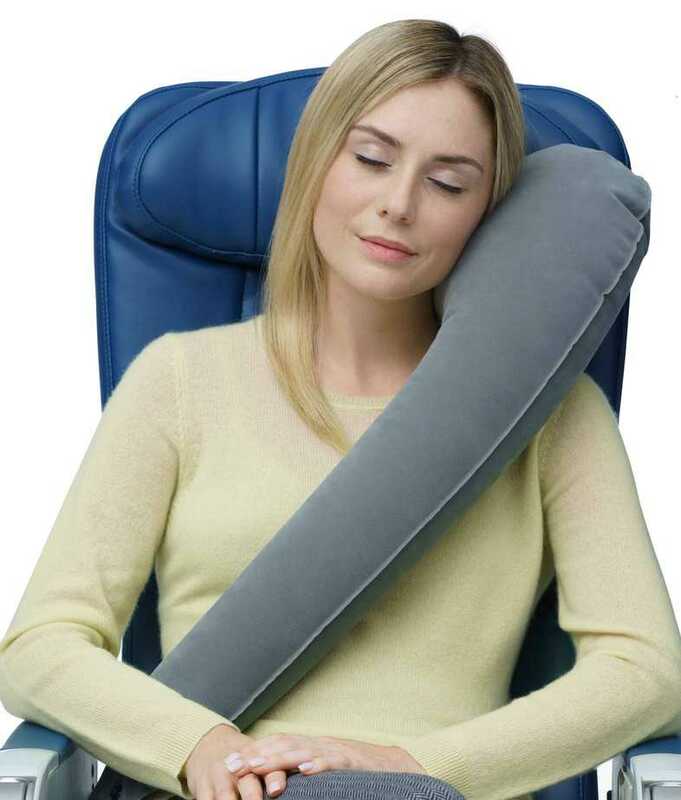 With a travel pillow, your gravity is kept central, so you won’t find yourself laying across your neighbor’s shoulder. Many people only think of a travel pillow when planning for a long-haul flight, but the reality is they’re very versatile. They’re perfect for long bus journeys, or for when you’re the passenger on an extended car trip. This is a tricky question, as you can categorize travel pillows in more than one way. Material is important, with 3 main types available. Style and shape is another essential consideration, and this is where pillows can vary widely. The cheapest material used in poor-quality pillows is basic foam. It absorbs odors and stains easily, can’t be washed in the machine, and is the least comfortable. However, it’s also the least likely to empty your wallet, making it a trade-off between cost and comfort. Memory foam is a vast improvement on basic foam, providing the same kind of support offered by memory foam mattresses. The foam conforms to your body shape and springs back into position when not being used. These pillows normally come with a removable cover, since the foam itself cannot be washed easily. And then there’s the inflatable range of travel pillows that rely on cushioned air pockets for support. Though not always as convenient, these pillows often have the smallest footprints when fully deflated. This makes them ideal for the space-conscious traveler. In terms of shape and style, there is far more variance. One of the most common travel pillow designs is the U-shaped pillow, which looks like a horseshoe. Other types include larger pillows that cross the body, and wrap-around pillows like the Trtl Pillow. However, this is definitely not an exhaustive list of the many designs available. Can I wash a travel pillow? How you clean your travel pillow will depend on what type of material it’s made from. For example, most memory foam pillows should be kept out of the washing machine. Always pay attention to the label when choosing how to freshen up your pillow — otherwise, you could damage the product. When washing machines are out of the question, there are a couple of alternative methods you can use. Washing these items in a bath or sink with gentle detergents is an option. Filling a spray bottle and misting the pillow with light detergents is another possibility if they’re not heavily soiled. Choosing a travel pillow is difficult and often down to personal preference. That said, if you pay close attention to comfort, build quality, and materials, some travel pillows clearly come out on top. We’ve recommended the best travel pillows based on aggregated customer feedback from across the internet. We’ve taken into account the positives and negatives highlighted by countless customers that came before. 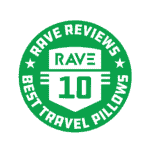 We’ve analyzed the feedback and have assigned our own RAVE Meter scores to each pillow. (There’s more on our methodology up towards the top.) Here are the results of our analysis: The Trtl Pillow is the best travel pillow that money can buy. If you don’t believe us, just ask the thousands of customers who have left wildly positive reviews on Amazon. Alternatively, there are many other runner-up pillows that excel in different areas, such as offering full-body or lumbar support. For the best eco-friendly pillow, consider the Therm-a-Rest pillow, or for the best budget pillow, choose the Travelmate. 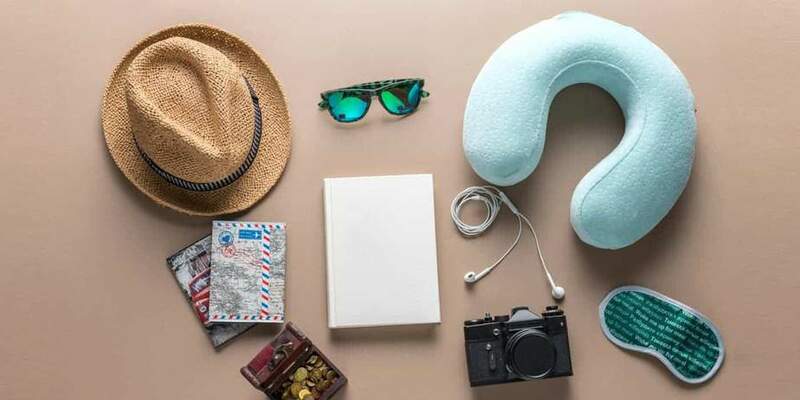 If you’ve already realized the benefit of taking a portable pillow on your travels, then check out these other recommendations. These products can help make the most arduous journey a little more comfortable. Amazker Contoured Sleep Mask: Block out the distracting sights and sounds that keep you from getting some shut-eye. This sleep mask, complete with ear buds, is contoured for a comfortable fit. Raytix Travel Money Belt: Zip compartments are safer than pockets when it comes to keeping your money where it belongs: with you. And nothing is more secure than a travel money belt that’s worn completely out of sight and out of reach. Kids Travel Play Tray: Because you definitely won’t be sleeping if the kids aren’t entertained. Syncwire Headphone Splitter: Want to share a playlist or watch a movie with your seat partner? The Syncwire Headphone Splitter allows you to plug 2 pairs of headphones into a single headphone port on your phone, tablet, or laptop.